Anyway, I just wanted to make a quick note to mention to any new readers that I am now completely vegan and have been for a number of years. 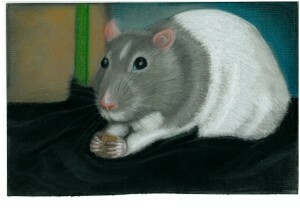 Futhermore, unfortunately I am also rat free – I became far to allergic so I stopped rescuing. When I got down to my last furbaby, he went to live with his human auntie and a couple of other ratty friends so he wouldn’t get lonely. Vegan recipes and reviews have definitely made up the majority of my blog content. I guess the blog advice sites were correct after all……! Besides from my family and husband (who I love very much!) the main things in my life are vegetarian / vegan cooking, my art, my crochet and my pet rats (*waits for the squeals of “But they’re diseased!”, “Ewww, their tails!”, and the old classic: “They’ll go for your jugular!!!”*) . So I’ve decided that I’m going to blog about them all! Anyhoo, over the next month I am attempting to go vegan for a fortnight (I have been a veggie and a “dairy-reducer” for a year now, but I’ve failed to convert to full blow vegan-ism due to my own weak mindedness); I will be attending a rat show (yes they really do exist! Like Crufts for rodents only breeders don’t compromise the animals’ health for pedigree status); and I will be trying out some patterns from the adorable amigurumi book that my “BFF” bought me for my birthday (in between crocheting “Granny Squares” for my blanket which seems to be going no-where fast….). So hopefully I’ll have plenty to blog about, and hopefully my blogs won’t be completely boring ?